Is Turbulent back at Chanel? I apologise for the lack of swatches and the general quality of the pictures in this post. But I saw these new blushers at the Chanel counter when I was in Sephora the other day and was determined to have photographic evidence of their existence. Apologies for the lack of posts recently, I just started a new job (and career path!). Whereas I was comfortably hidden and laboured in the back before, I now work directly with customers at the front of the house. My work schedule is irregular, and just to make things even more interesting I am in a battle with the new pair of heels given to everyone as part of the uniform for the past few days. My feet just aren’t made for standing/walking in these shoes for 8 hours a day and my feet are in pain ever since I started the job. One of the errands I need to do today is to pick up even more insoles and shoe ‘cushions’ to make them more bearable. While I haven’t had time to post I did manage to catch up on the new releases through other beauty blogs. My new workplace is on the Champs-Elysees, and I’m not too far from Sephora. I made some time before work yesterday to check out the Giorgio Armani Eyes to Kill eyeshadow quads. I have my eye on Maestro now (the grey palette), although the price tag is quite hefty at 63 euros. I haven’t forgotten about the soon-to-come Burberry eyeshadow quads, so perhaps I’ll wait another week until November and do a comparison. Although I have a feeling I’ll probably get the grey from Armani and a neutral one from Burberry. Meanwhile I have been wanting to post a comparison post of the L’oreal Infallible liquid Shine Caresse lipstick (YSL glossy stain dupe) for a while but for some reason the lipstick disappeared after the man did a bit of tidying at home … so I’m afraid I can’t do anything until I find it again 😦 They cost about 14 euros and I’m reluctant to buy a replacement just for a post because it’s not that cheap really for a drugstore brand. I picked up the colour ‘Juliet’, which is a red. We also finally got the Revlon just bitten kissable lipstains about a month ago on our shores. I passed at first but am now thinking about the shade ‘Crushed’. October is coming to an end (already). I’ll have a bit of time the next couple of days to update the blog, which I’m really looking forward to do because I have lots of ideas and thoughts to share with you all. "It’s not a journey … "
I do like this better. The images draws attention away from the words so it doesn’t seem as abstract as the first video where we are just concentrating on Mr. Pitt and his voice. Inevitably (ha!) they both remind me of the ‘Tree of Life’, the end shot of space and planet probably has something to do with it. 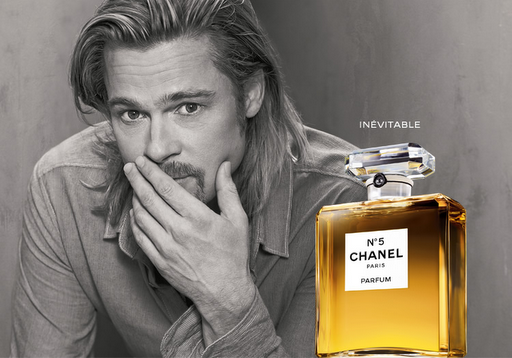 I’m not sure how effective this is for Chanel No. 5 … then again the fact that I’m blogging about this is perhaps saying something. Bravo Chanel! And this video is the story of Chanel No. 5, which ties everything together. It was the first released among the three. The theme is innovation – of the perfume, its packaging and marketing. Le Bon Marché, the department store on the more sophisticated left bank of Paris, is celebrating its 160th anniversary. Of course, nowadays no celebration is complete without a special collection of limited edition designer collaborated items. But before I get into that, the lady you see in the picture above is Catherine Deneuve, drawn by Marjane Satrapi. There are a series of prints you can buy that come in a very pretty box and I believe the proceeds go to a charity for sick children. There is also a photo booth with this drawing of Catherine Deneuve that you can take a picture with. I’m not sure exactly what that means, maybe it’s super-imposed on the picture. 5 euros a pop. It’s like the photomaton you see in the metros, but a lot cleaner of course. I happened to be at the Bon Marché today to indulge in my other hobby – knitting. Sad to say that after the renovation and relocation, they have reduced the selection and only kept the bigger yarn brands. There are bargains to be had though, well 20% off at least. Noro Silk Garden (yup! ), Debbie Bliss Paloma range, lots of Rowan and Clover needles – it looks like they won’t be carrying Clover anymore. Anyway if you’re into knitting/craft and live in Paris, go take a peek. And while you’re there, you can have a look at all the exclusive items on the ground floor. The area showcasing the 160th anniversary items is in the middle and goes all around the shop. It takes up quite an amount of space and there are lots of goodies to be had. One area shows the works designers reinterpreted with the graphics and colours of Bon Marché, paying homage to its history. The other area are exclusive designs for this particular event by iconic fashion houses and designers. Notable items (also very expensive) include a beaded Fendi bag at more than 3000 euros, that incorporates the design of the store’s iconic escalators, and a special Dior handbag in a very pretty burgundy/violet colour. Beauty-wise, I saw special engraved and numbered Bois d’Argent cologne from Christian Dior, Serge Lutens offers engraved bottles of Ambre Sultain, there’s fracas, Killian and many, many other fragrances. There is a special edition Chantecaille compact, and one from byTerry. I can’t remember which one was gold and red, and had ‘160’ as part of the powder design. Clinique had a boring metallic pencil box of 3 chubby sticks from existing collection. Chunky cherry, the graped one, and maybe the raisin. I can’t be sure of the last one. This page is from their online catalogue, it has the most beauty related items on one page. The printed T-shirts all have le Bon Marché mentioned somewhere. Isabel Marant has a cute hand-drawn one that at least seems to take more than 5 minutes to do, unlike Comme des Garcons’. But I digress. I did pick up two things, a nail polish and a diptyque candle. It is a classic red. The closest colour I have to this is Rimmel Professional in 323 Riviera Red. But 323 is more orange. I actually don’t have that many true red polishes. ’24 Sèvres’ reminds me of what my mother used to wear, or a Chanel lipstick. The name refers to the address of Bon Marché. Here is the diptyque candle. I have always liked their candles (who doesn’t) but it’s been a few years since I last got one. My last one was either Geranium Rosa or Baies. I haven’t opened it yet but a quick search tells me this scent was released in 2009 for the holiday. I will take a photo of the jar when it’s opened, and I’m hoping it’s a pretty one. I thought I’d do a post on this because it’s probably the prettiest eyeshadow quint I own and one of the most colourful. I have no copies in my (smallish) eyeshadow collection that resembles the shades found in this quint (apart from the top right shade). Two darker shades, a duo-chrome olive/khaki/brown and a vivd royal purple. Picture doesn’t do the purple justice, it has a little more red and looks velvety … think Prince. Two highlights, the middle icy blue and the top right silvery lavender (it looks too pink in the photo). These two have a silver overlay that disappears when used. You can see this on the ‘CD’ in the middle where the overlay is gone. Last is a bright, light blue. There are 6g of product total. Again publishing this on a Friday. If you like Burberry eyeshadows and wish they came in convenient palettes, mark your calendar for November and take a gander at this and this. I’m glad they chose November – at least it’s closer to Christmas to be justified it as a present for the holidays. The MAC x Marilyn Monroe collection launched officially today. In Paris it has been on ‘avant-premiere’ for a week at Printemps, which I only found out yesterday so naturally I waited. There’s only one item I wanted and it’s the re-promote blush in The Perfect Cheek.